Well… things got a little out of hand and it turned into over 100 SEOs at Just Eat’s offices, courtesy of Gerry White. To give some semblance of order, Pete moderated a panel. Since this group lifted their usual “Chatham House Rules” for the evening, I started taking notes. So this is me, nearly live blogging. Pete Mead moderated Judith Lewis, Ross Tavendale, Hannah Thorpe, Grant Kemp, Arnout Hellemans, Gerry White (Just Eat), Juliette Van Rooyen and Nick Wilsdon (Vodafone) arrived a bit late. Here are my rapidly written tips as the panel said them… They are not direct quotes, as I was paraphrasing. Brand rocks. 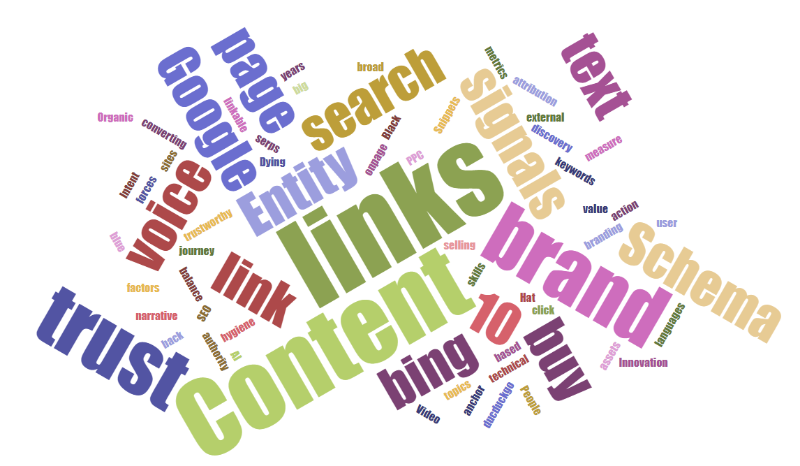 Build good links and good content around it. Thinks YOU need to be trustworthy before links give you value. So fix trust factors in your own site. Technical, content and discovery are hygiene factors. Google has gone back 10 years… to on-page signals, validated by off-page factors. Refocus back on keywords, which he sees as a weird thing for him to be recommending. Overall, Google trying to move away from links, but finding other signals. EG Brand and other ways to value authority. Entity search is the way forward but links still very effective. She still buys link (for converting traffic). Google is selling the SERPs page any way it can. The casino industry has to buy links (Ross disagreed… has built non-casino content and no-one cares it is hosted on a casino site). Agreed that Google looks at links only after it understands the page content first (with AI). Big sites (with broad topics) are harder for Google (but she is eBay). Black hat may work, but no place in agency world. Do not think of links/brand etc as separate signals, they are all trust signals. Entity search will be massive in 2019. The 10 blue links are disappearing and we are not there yet as an industry to handle that. Pitch SEO as a branding thing… so getting a brand in a SERPs, does not need a click to count as a win. Outside the industry, people trust Google. So get in the answer box (position zero). Snippets etc are discriminating against diversity, as it is all in Schema/digestible. Pete asked the panel: “is content king”? Ross: Sure. Video content rocks. Find the commercial imperative of the Facebook’s and Google. And use that to control tour own narrative. Arnout: In Scandinavia, content gets you nowhere, it’s all about linkable assets. Anchor text is weighted too heavily in non-English content. Google doesn’t understand other languages very well (yet). Getting better, but still not great. Hannah: So does that mean smart people optimize for now, or for when they catch up. Her answer is to balance both approaches. Nick Wilsden: Absolutely it is the future but will not take over. New types of search. Alexa skill, Amazon, domain squat the skill names. Google Voice. “skills ate search” – much cynicism in the room. Tim Stewart: Alexa will concentrate on intent, not discovery. “Alexa, buy wine”. Arnout: Google is now trying to play catchup with this action based approach. Judith: Concentrate entity and schema blends voice and text search. Luke: Nobody talked about external factors (away from Google). Duckduckgo, bing are gaining popularity. Arnout: But Bing is still tiny at the moment in comparison. Ross: Liquidate and create cash. Sack non-core innovation projects. Nick: A recession is coming (in March). Make sure you are checking the little things and measuring. Nick gave shout out for Little Warden. Grant: Surface analytics data to as many people as possible. Set it up correctly. Get someone in your team to track all the errors that users see. Ross: Keep doing what works for YOU, not what everyone else says. Nick: Do the basics. Get your site working. Also voice. Worry about the recession coming. Data-driven SEO. Juliette: Measure so you can demonstrate value. Understand SEO does not work in isolation. About here, I ran out of puff. But fear not – there’s another London meetup (this time WITH Chatham rules) on the 25th January, although I personally will be at the links conference, LRTCon, in Vienna.